On the bottom of your device there is a menu. This menu navigates you through the app. Make sure you agree to let this app use both your location and your camera. Both are used solely for app purposes. There are no pictures or movies made or stored, and it does not store or give your location to anyone. 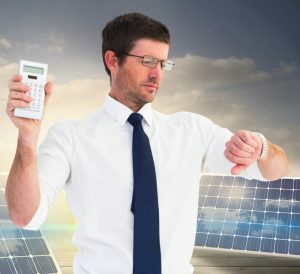 The camera is needed to “look through your phone” and a gps location is needed for the sun calculations. If you have don that, just hold your phone in front of you and slowly turn from left to right. Where you see a moon and stars there will be no sun, they will disappear and a sun will rise. You can see where the sun rises and sets. 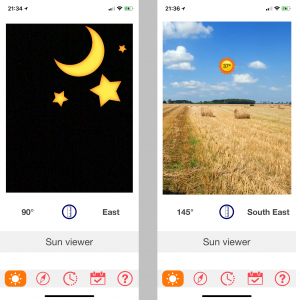 This app works on the compass in the iPhone, to be sure you might want to check the iPhone compass to see if it’s synchronised with the sun position viewer compass. You can tap the icon for a handy ruler. At the left hand side of this ruler you’ll see the compass degrees at the right hand side you’ll see the general direction. 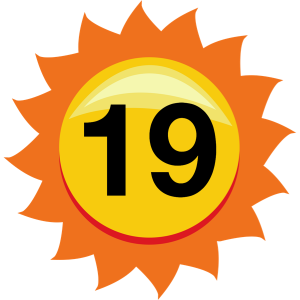 In the sun you’ll see a number: This is the height degree of the sun. Where 90° is the highest point, and 0° is at the horizon. If you look at the figure above the number in the sun is the number of degrees between A & B. In this figure it would be around 45°. 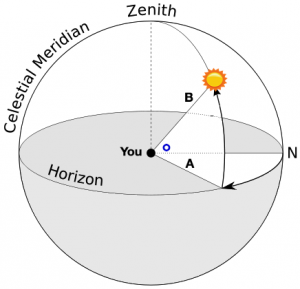 If the sun would be at the word “Zenith” it would be 90°, and at the horizon it would be 0°. Also you should know that usually the max sun height is much lower than 90° depending on the season and location. For the exact 90° you should live on the equator.